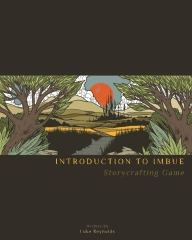 The Imbue roleplaying game is one of imagination where players interact in a world of their own creation. The game is structured around a story with players guiding the protagonists through the scenes, making decisions about how the characters will act or react to the setting. To determine how well their decisions fare, players draw cards from a freshly shuffled deck of playing cards. Imbue has a rich history and culture permeating through to the current age of planet exploration and colonization. You have the chance to not only bear witness to births of nations on foreign worlds but to found, build, aid, and destroy such nations. Adventures in Imbue run the gamut from exploring new planets, building settlements, investigating mysteries, and performing espionage on other settlements. 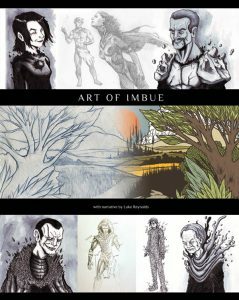 A book featuring 30+ pages of illustrations, sketches, and behind-the-scenes commentary by Imbue producer/writer Luke Reynolds. A book composed of five chapters introducing the game mechanics, classes, sample settings, sample antagonists, and a glossary. Readers will not be able to play the game by reading this book; rather, it serves as a proof of concept and a sneak peek as to what’s to come. The full game is scheduled to launch in 2019.